As you might imagine, there is a veritable plethora of wildlife hanging around in these Adirondack Mountains. We have whitetail deer, moose, (meese? ), black bears, my favorites, the fun-loving otters, coyotes, bobcats, special Adirondack wolves, and a bunch of other creatures great and small. In recent years, black bears have become less and less timid around civilization simply because they equate people with easy pickings for dinner. Yes, think Yogi and Boo-boo and pic-i-nic baskets. One of my favorite persons, Ed, the resident wildlife biologist and New York State Department of Environmental Conservation (NYSDEC) Region 5 Wildlife Biologist is the man who knows all about black bears in the Adirondacks. Sometimes he calls them "nuisance bears," which is hard for me to accept since they are so cute. I especially like the one pictured today. She is clearly waiting for her friend to come out to the gossip fence so she can fill her in on where the campers have stashed their food. If you are looking for something to do this Saturday evening in the Adirondacks, and want to learn more about our black bears, stop by the Adirondack Mountain Club's High Peaks Information Center in Lake Placid. 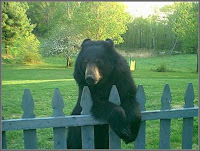 Ed will be speaking about my cute friends the black bears at 8:00 p.m. He has great stories and statistics and an awesome slide show.